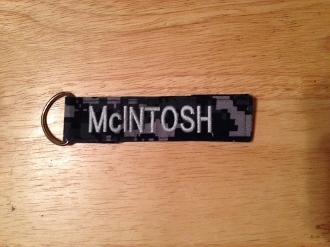 Key Chain made from heavy fabric in different branches military camo or solid colors. Example: Navy - Digital Blue Camouflage. Available with Silver/Gray letters or Pink letters with your name choice. Other colors are used for different branches to match the fabric. Please note that items ordered with embroidered names take longer because of the custimization so allow extra time for delivery and This Price includes FREE Shipping!